This shop has been compensated by Collective Bias, Inc. and its advertiser. All opinions are mine alone. #WasteNoPaste #CollectiveBias Risotto is one of my all-time favorite foods! When I find risotto on a menu, I know I have to get it. 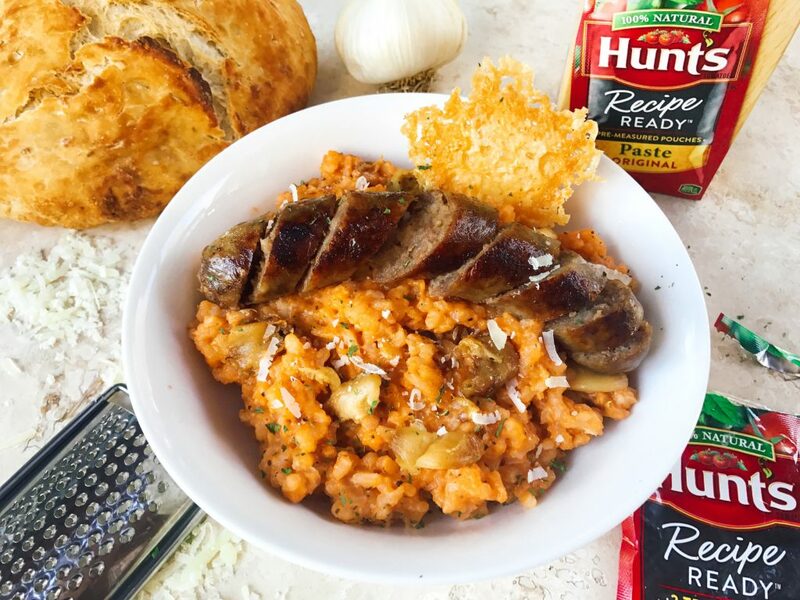 You can bring the joys of risotto home with this Sausage, Tomato, and Roasted Garlic Parmesan Risotto. When I studied abroad in Italy for college, I was on a mission to find risotto as often as I could. And now, every time I go back, I do the same and hunt down risotto. Making risotto was always somewhat intimidating to me. I would hear about how difficult it is to cook. Lots of stirring and the gradual adding of liquid sounded complicated so I avoided it for a long time. But it is really not that difficult, it just takes a little time and attention with the stirring. Just get comfortable, grab a glass of wine, and settle in for some one-on-one personal time with your risotto. You can do it, too! 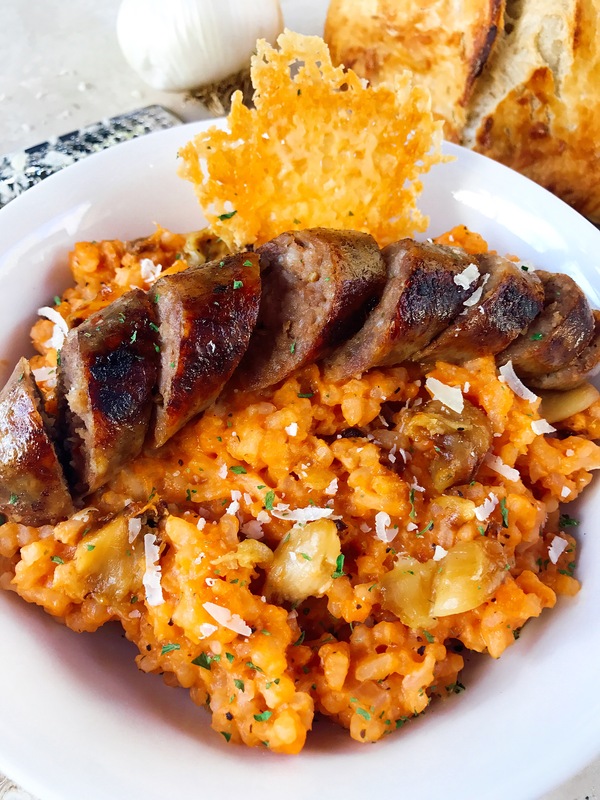 It is definitely worth the effort and this Sausage, Tomato, and Roasted Garlic Parmesan Risotto will likely become a family favorite! Because the moisture content is important to risotto, you want to use the right ingredients! That is where Hunt’s Recipe Ready “Pre-measure 2TBS” Paste Pouches are perfect! One pouch is perfect for this recipe and gives the risotto a well rounded tomato flavor without extra water. Where have these been all my life?!? 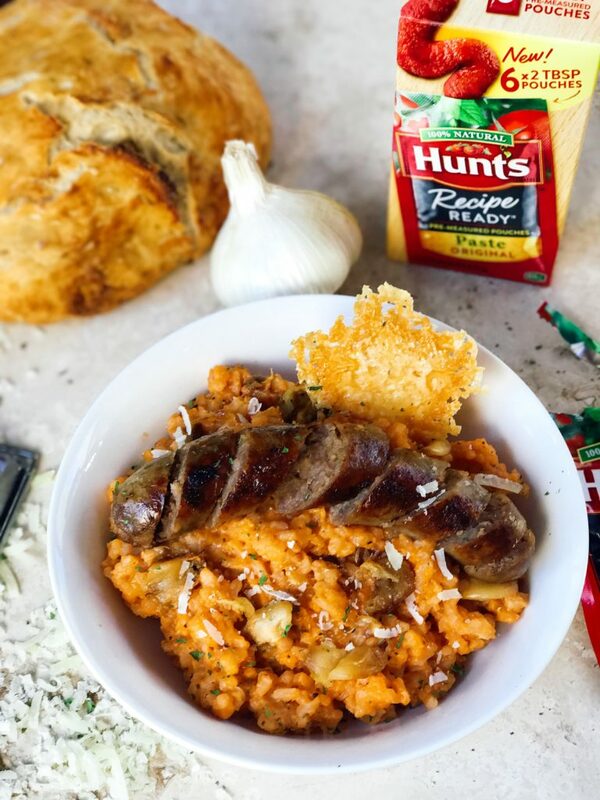 These new Hunt’s Recipe Ready paste pouches are easy to find. 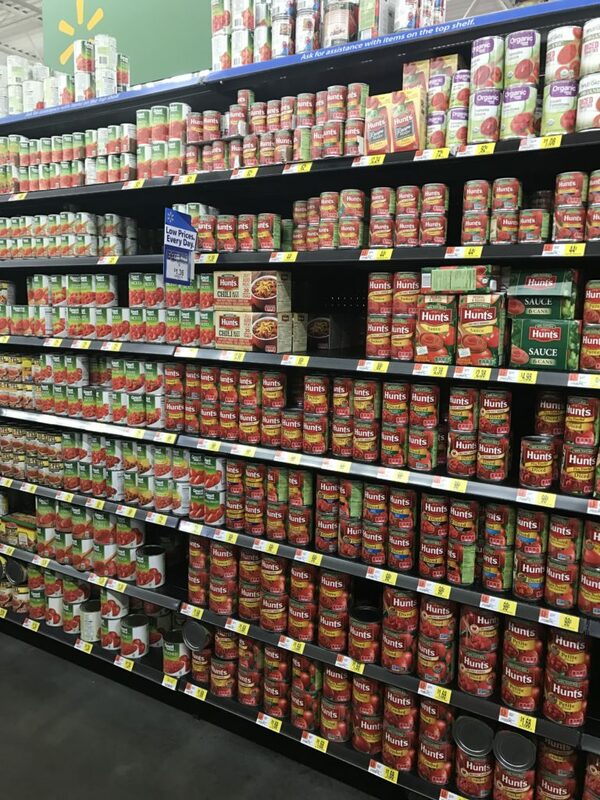 They are located with the other tomato sauces and pastes which makes them easy to grab at your local Wal-Mart. I love these new paste pouches because you do not have to waste so much paste from what is leftover in a can. They are recipe ready which means easy to use! Just tear and squeeze! These pre-measured 2 Tablespoon pouches are new from Hunt’s and so incredibly convenient. Find more tomato paste inspiration here! I also find that tomato paste has a depth of flavor that other tomato sauces and products can not match. These paste pouches are the perfect addition to this dish! The quality of Parmesan in this Sausage, Tomato, and Roasted Garlic Parmesan Risotto is extremely important. 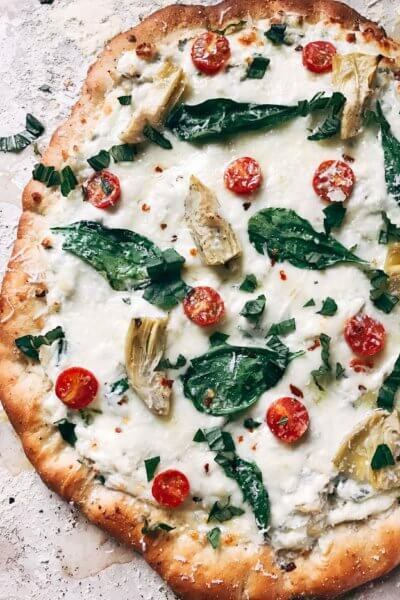 The cheese is a primary flavor and so you want to use ingredients that taste good as it will just make the dish better. If you use the pre-ground, cheese in a can stuff, it will not taste as good. You get out of it what you put into it! I hope you love this risotto as much as we do! Want more risotto? Try out our Roasted Leek and Brie Risotto, Balsamic Caprese Risotto or Roasted Asparagus and Sweet Corn Risotto. Roast your garlic if it is not done already (see note). Place the stock in a pot and heat over medium low. You want the stock to be warm when adding it to the risotto so that the temperature change does not affect the rice. In a large pot over medium heat, melt 3 Tbsp of the butter. When melted, add the red onion. Cook until the onion is translucent but not yet browning, approximately 3-5 minutes. Add the rice and garlic powder. Stir. Continue cooking to slightly toast the rice until it is just starting to show a little brown color, approximately 3-5 minutes. Add the white wine to the pot. Cook until the rice is almost dry, where most of the wine has been absorbed. 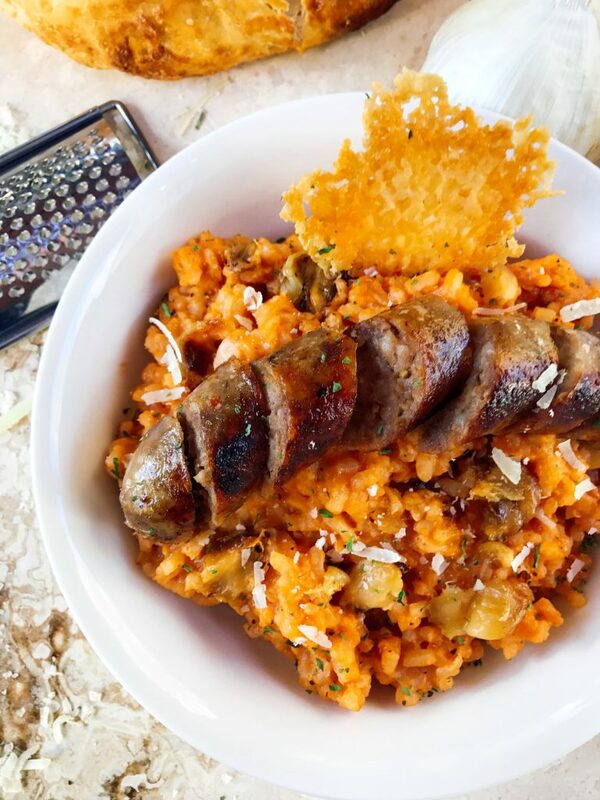 Start cooking your Italian sausage while your risotto is going. Heat a medium saute pan over medium heat. When hot, add the sausage. Cook until browned, approximately 5-7 minutes. Flip and cook until the other side is browned and the sausage is cooked through, approximately 5 minutes more. Set aside. Add 1/2 cup of stock to the rice. Stir continuously until most of the stock has been absorbed. Repeat this process one cup of stock at a time until the rice is cooked thoroughly. You want the rice to have just a little bit of bite left so that it is not completely mushy. Depending on your rice, you may need more or less stock for the right consistency so start tasting the rice after 4 cups have been added. When your rice is cooked through, remove the pot from the heat. Add the rest of the butter, the Parmesan cheese, roasted garlic, and tomato paste. Stir to combine. Taste the risotto and season with salt and pepper as desired. Serve with Italian sausage or other meat of choice if desired. 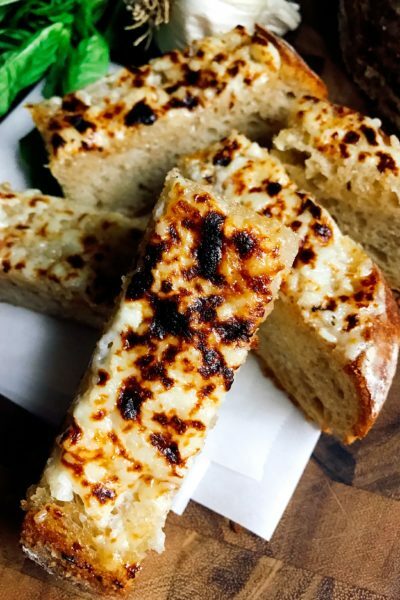 Learn how to make roasted garlic here! One head of roasted garlic is enough, but if you are a garlic lover like me, go for two! Any white wine is fine, just make sure it is something you enjoy drinking as the flavors will concentrate into your food. 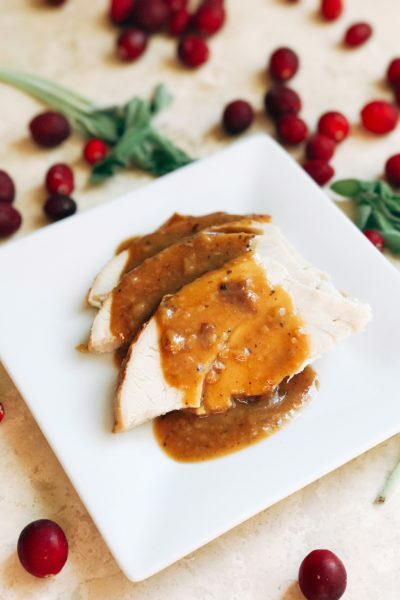 This looks incredible, the perfect fall meal if you ask me! Rissoto is one of my very favorites! Looking forward to trying your recipe. That bowl of risotto looks perfect! Wonderful flavors. Lots of my fave foods in one! Yum! Didn’t realize Hunt’s had little pouches like that. Will have to check it out! Kim this looks so delicious! Love the unique combination and that you combined tomatoes and sausage! 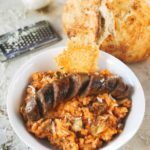 A good tomato paste definitely can make a real difference to a recipe and this sausage risotto sounds delicious! LOL I’m the same way! I think I’m ordering something else but I always end up with the risotto. This looks amazing. Cannot wait to try this at home. I’ve never made Risotto before but you make it look so easy! I am all for these packets, they will totally help my avoid waste! Your risotto sounds so flavorful! 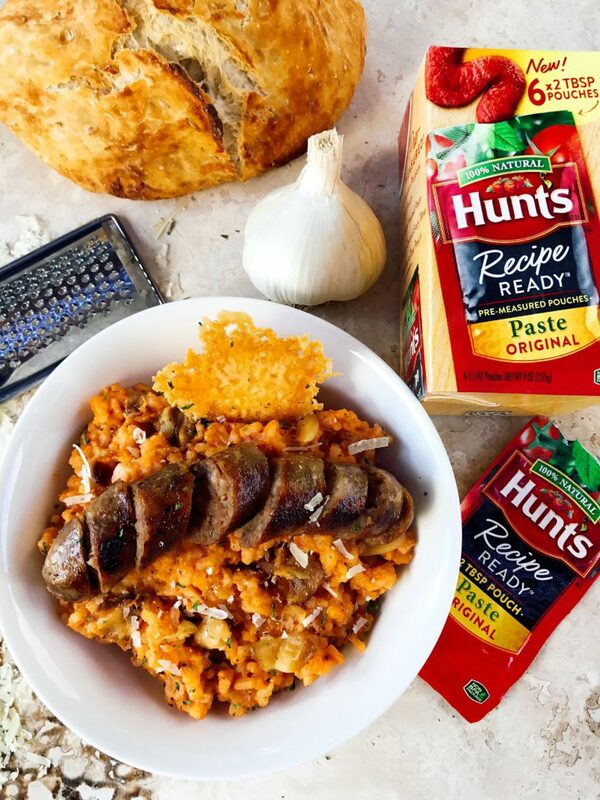 I need to get my hands on Hunt’s Recipe Ready paste pouches so I can give your recipe a try! I keep meaning to pick up those pouches, I’m so often throwing away leftover paste! 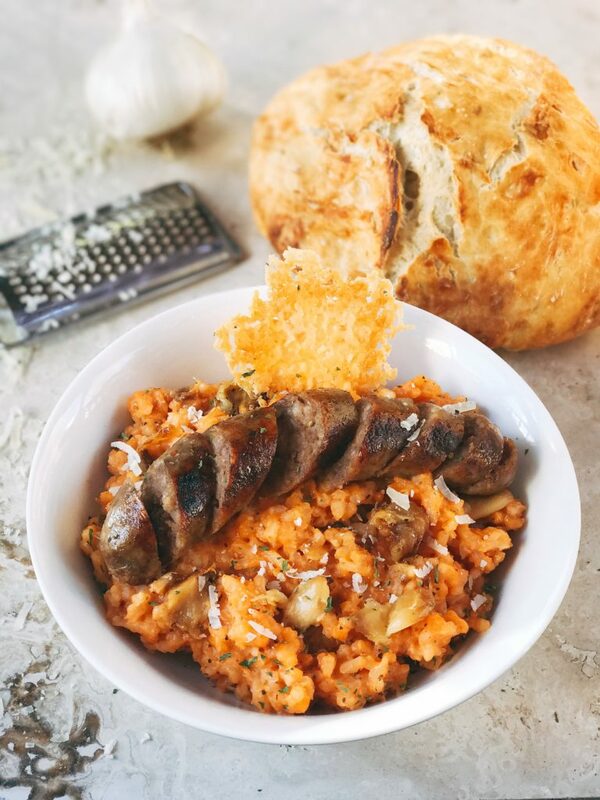 That risotto screams “comfort” and “get in my belly” to me! Those pouches are brilliant. I cook for only two of us, so then I’m always playing games with the rest of the can, preserving it – and so I really don’t use tomato paste as often as I’d like to! (I tried the fancy gourmet store tube – but it cost so much I hardly dared use it! Not much help there… ) I have to keep an eye out for them here. Wishing I would have had this for dinner tonight. Yum! I love garlic! I’d put so much garlic in that risotto! when do you put in the garlic powder? Just made this tonight. Huge, huge success! I use a 3/4 cup ladle and set a date night with me and my risotto on medium low. 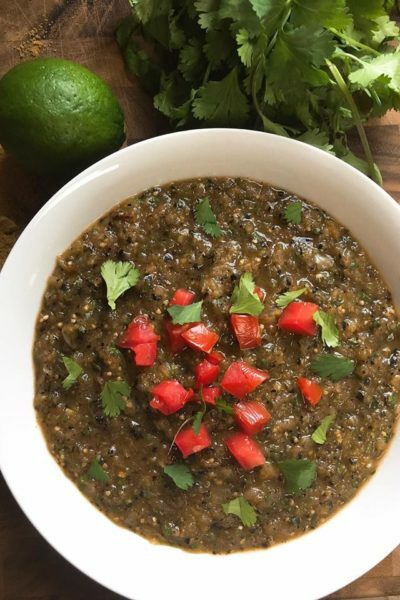 The goal is to get the sauce absorbed into the rice and keep it as one mass (think green slime) and make sure that the wet gloop turns to gloss before you add in the next ladle-full. I honestly do not know if it would be possible to make this dish better. It is perfect. The mild sausages I grilled were the perfect compliment. The creamy rice, the tangy tomato and the rich salty cheese–topped with the zest of the brown garlic and a shake (or two) of lively parsley made this dish the envy of any other risotto recipe. THANK YOU! 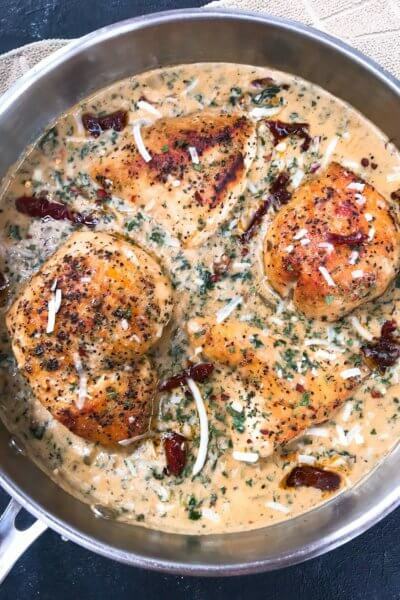 I am SO glad you liked it and you have completely made my day 🙂 Your date night in the kitchen with the risotto sounds perfect!